I realized this weekend that I do not have even one mango reviewed on this website. I was truly puzzled by this discovery because I would list the mango as one of my very favorite fruit of all time. It was the first “exotic” fruit introduced to me by my grandmother when I was five and was a huge departure from the orange, apple and banana I had experience up to that point. It remained the most exotic thing I would try for another 15+ years. My grandmother died when I was six, so it sticks out as one of very few memories I have of her. She was introduced to the mango when she lived in Hawaii — a place she lived for quite a few years, as did my mother, as did I — all in our twenties. All of us either moving toward or away from various men. In a way, a mango represents strength to me, and independence. For each of us the relocation required a great amount of courage. I think there is some part of me that feels the mango, the fruit I so closely associate with all of these memories, is sacred and shouldn’t be rated the way I do on this site. I don’t know. I can’t think of a good reason why I keep deciding not to highlight one here. But I keep doing it, so there must be some logic to it. Regardless, I was delighted to see a Mango Orange variety of citrus at the market this week so I had a chance to celebrate my beloved mango in some small way without having to rate it just yet. If you see this orange I definitely recommend it, as well as any mangoes you find of course. And when you see them, I hope that for a small moment you are reminded of this story and pause to connect for a moment with your own strength and courage, right there in the grocery store. Because really, is there any other time? 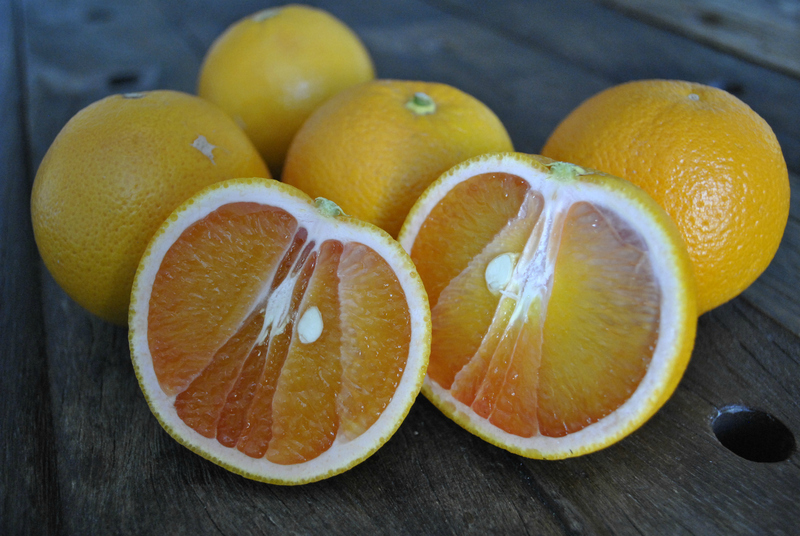 Baseball size, perfectly round orange with gorgeous flesh ranging from sunkist orange to salmon pink. Juicy, tender flesh that seems to just melt in your mouth. This might be the very best citrus texture I have ever tried. I would dare to say it is creamy. No acidity or tartness in the flavor but I can feel some acidity on my tongue in the aftertaste. Think of a sweet mellow orange magnified with well rounded vanilla flavor. While I like this orange quite a bit particularly for the texture, I tend to like my citrus, and really most fruit actually, with a nice bit of acidity. This orange is missing that extra punch of flavor. I’m also slightly disappointed it doesn’t taste anything like mangoes, though I suppose an argument could be made that the flesh looks a little like one, but it would be a thin argument. I read in the LA Times that this orange’s real name is Vaniglia Sanguigno, Italian for “Vanilla Blood”, and I have to admit that despite my confessed love of mangoes, I find that to be a far more fitting name. It has a pretty clear vanilla note and the coloring is certainly more reminiscent of a blood orange than a mango. Also, I like the idea of telling people I had Vanilla Blood for breakfast. It takes the idea of fruit giving strength to a whole new level. What do you think the better name is? Mango Orange? Or Vanilla Blood? Which name would get you to buy it? Clearly I would buy it either way. I am interested in the mango orange. Where can I find it? I really dislike this fruit! I’ve bought them twice, from a good grower. I’d agree that the appearance and texture are fine, but I dislike the flavor. An orange without any true orange taste and without any acidity is just weird and lacking in anything I want in a citrus fruit. Or the tang I want in almost any fruit, except maybe a banana. And it’s not just what’s missing. There’s a flavor that is there that I just don’t like. I hope I remember this and don’t buy them again by accident! Very strange subdued flavour profile. Creamy and floral come to mind. It seemed to have more in common with the taste of a dragon fruit than a mango. Vanilla blood is the more descriptive name to me – I stumbled on this site trying to find out the name of the vanilla flavored oranges I bought by accident. The beautiful pink color and totally unexpected sweet, smooth vanilla flavor made eating these oranges for the first time almost like a mystical experience…. I find them very bland. No noticeable orange flavor and no tartness. Sugary yes, but no sweet/sour balance. kind of like a solid form of sugar water. Never again.